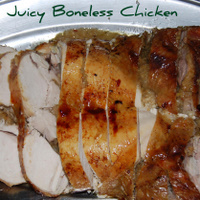 We love this juicy, boneless chicken recipe with it's delicious light herb stuffing. It takes a little effort, but you will be delighted with the results. Check out David's video below on how to do the boning....it's a lot easier than you think. Give it a try you'll love it too. 400ml home made stock (made from the chicken bones, with a small onion quartered, a large carrot, a stick of celery, 2 cloves of garlic, and a handfull of parsley all roughly chopped, a bouquet garni, 4 black peppercorns and a good pinch of salt. Put into a pan and covered with a litre of water and allowed to simmer for a good hour with the lid on. Or use a good quality bought stock or a stock cube dissolved in 1/2 litre boiling water. A little Cornflour/cornstarch slaked with some water to thicken. First make your stuffing by frying the onion in a little olive oil over a medium/low heat until soft, golden and caramelised, about 8 minutes. Pile in the breadcrumbs and the herbs, and mix well. Add sufficient red wine to just moisten the stuffing, so that it is still quite firm. (Usually about 2 - 3 tablespoons) Season to taste. Stir over the heat until everything is well combined. Meanwhile lay the deboned chicken skin side down on a chopping board. Pile on the stuffing and press well down with a wooden spoon into the flesh. Fold each side over (left to right and right to left) to just overlap each other. Take an 8" skewer and thread it through the two edges to seal them. 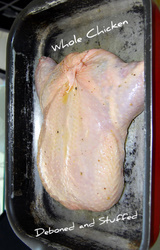 Place in a roasting tin that has been greased with a tablespoon of olive oil. Smooth a little more olive oil over the skin of the bird and sprinkle with a little salt and ground black pepper. Place onto the middle shelf of a pre heated oven at 180ºc/350ºf or 160ºc/325ºf in a fan oven. Roast until golden brown approximately 45-60 minutes. Use a meat thermometer to make sure it is cooked. Remove from the oven and place on a serving platter, and allow to stand covered. Take the roasting tin and remove any excess oil from the meat juices. Put it on to medium heat and add the red wine and deglaze by scraping the juices in the tin with a wooden spoon. Then add the stock and bring to the boil. Allow to boil vigourously for a minute and then turn down the heat and add the cornflour / cornstarch mix, stirring well, until the gravy is the consistency that you like, and simmer for 2 minutes. Adjust the seasoning. Pour into a gravy boat. Serve the chicken and slice it at the table for best effect. It really is so easy to carve. Then serve the delicious gravy and your choice of vegetables. You and your guests will love it!